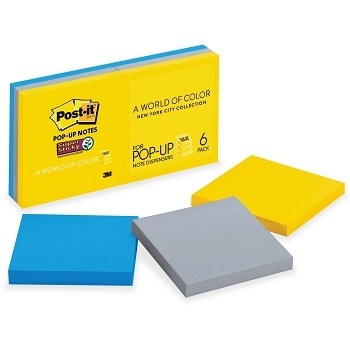 Post-it® Pop-up Notes If you work in a fast-paced environment, you're going to need notes designed for quick and efficient use. These note pads utilise a unique accordion-style design that pop up, one-by-one, making sure the notes are always at the tip of your fingers. 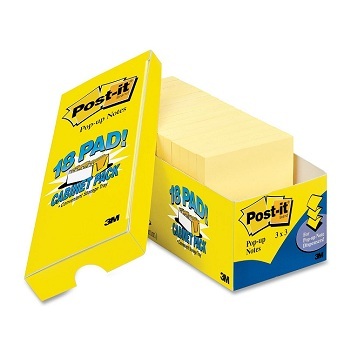 Designed for use with Post-it® Pop-Up dispensers. 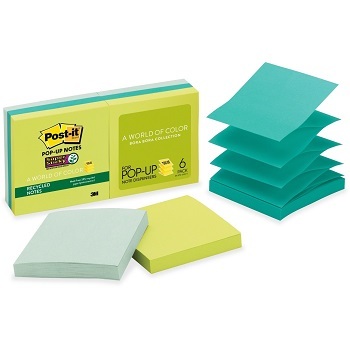 Environmentally friendly Greener Recycled Helsinki Collection Post-it® Pop-up Notes. Manufactured from 100% recycled paper and a plant-based adhesive which means no new trees were used. Helsinki Collection (Pastels) recycled self-stick, repositionable, pop-up adhesive notes. 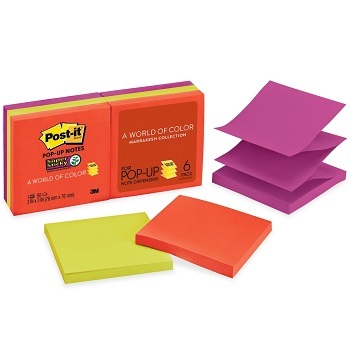 Create colourful reminders with these Marrakesh Collection Post-it® Pop-up Notes. These colours convey the genuine energy and movement found in this desert jewel. Marrakesh Collection (formerly 'Neon Colours') super sticky, repositionable, pop-up adhesive notes. Pack of 6 x 90-sheet pads - 76 x 76 mm (3 x 3") for use in Pop-up dispensers. Colourful Rio de Janeiro Collection Pop-up Notes to make your messages sparkle. Rio De Janeiro Collection (formerly 'Ultra Colours') super sticky, repositionable, pop-up adhesive notes. Environmentally friendly Recycled Pop-up Notes in calming colours from the Bora Bora Collection. Assorted pads in a refreshing palette that feels like an escape to paradise. Bora Bora Collection (formerly 'Aquatic Colours') super sticky, repositionable, pop-up adhesive notes. Pack of 6 x 90-sheet pads - 76 x 76 mm (3 x 3") for use in Pop-up dispnsers. Get your messages noticed with these New York Collection Post-it® Pop-up Notes. These colours are inspired by the skyline, stone and steel of New York. New York Collection super sticky, repositionable, pop-up adhesive notes. 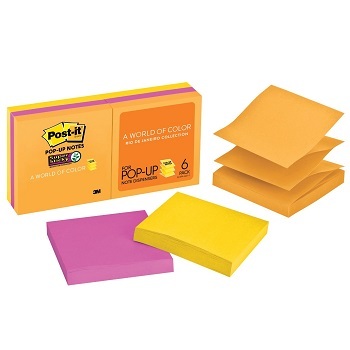 Yellow ruled Post-it® Pop-up Notes... to keep you in line. Traditional yellow notes ideal for notes and to-do-lists. Canary Yellow original self-stick, repositionable, pop-up adhesive notes. 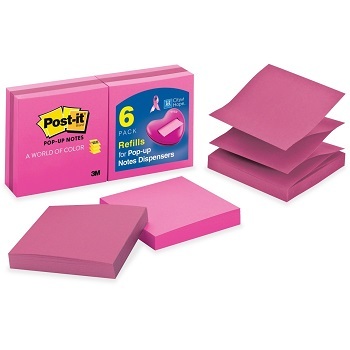 Never run out of your favourite Post-it® Pop-up Notes again! Ideal for Office Stationery Cupboards, Reception areas, Home/Office and much more. Neatly packed bulk size slides easily into cupboards. 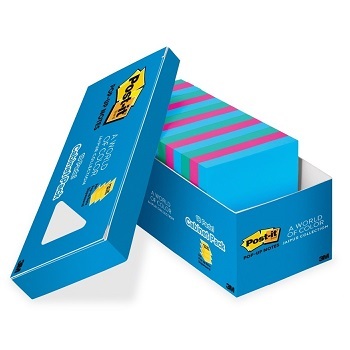 Never run out of your favourite 3 x 3" Post-it® Pop-up Notes again!